What’s with all this bloody sugar? Sometimes I fancy a piece of cake. I’d prefer to make it myself but sometimes I have neither the time nor the inclination and as I have probably to eat all of it, especially if it’s a fruit cake, it’s not good for my health – everything in moderation my grandmother taught me. Today was such a day: my wife is preparing for an interview so my share of the domestic necessities – cooking etc – has risen temporarily from the norm of around 50% to 100%, and I have a few short deadlines to meet with writing for my employer (forthcoming newsletter, complete content for a new website, several brochures/leaflets and a T-shirt slogan for a soon to be upon us event). 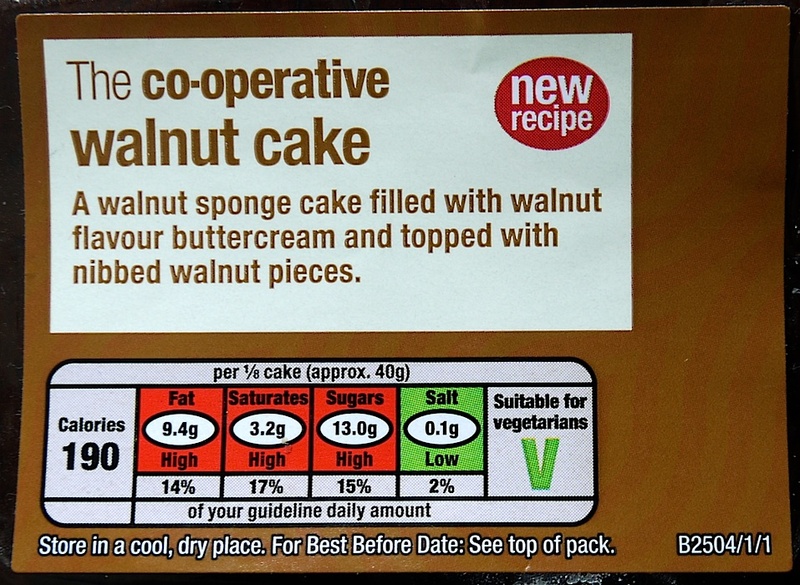 So, nipping to the nearby village shop – which happens to be a ‘co-op’ – I bought myself a small slab of walnut cake. Label proudly announcing ‘New Recipe’; red for warning? “The cooperative, gud with fud” (Scottish accent, supposed to convince us that the speaker is honest and reliable), we are told repeatedly on tv and radio, so much so that even when we see a poster or shop sign with this message the sund (see, even my writing’s caught it!) of that voice rings in our ears. Good with food? I don’t think so. This bloody cake tasted as though I’d bitten into an old-fashioned loaf of sugar, but nastier. Yet the label proudly announces with an eye-catching red seal ‘New recipe’. At least it didn’t say ‘Improved’. A bit late, I examined the label more closely. According to the much vaunted ‘traffic light’ warnings labelling, 13g of a 40g slice, ie one third, is sugars. Is such ‘warning’ labelling accepted by some of the food industry only because they know that it’s completely ineffective, or is it just that my powers of observation have sunk close to nil in my dotage? The only green was for salt; fat and saturates also had big red no noes. I hadn’t realised that the red of the ‘new recipe’ was itself a traffic light warning. According to the list of ingredients, which I believe are supposed to be listed in order of the proportion of each ingredient, sugar is third after wheat flour and egg (proudly announcing ‘free range’, but who the hell cares with all the crap listed further down the list – a veritable chemistry laboratory), but then fourth is brown sugar, and a little further down is glucose syrup. If the three had been lumped together I guess ‘sugars’ would have come top of the list. I occasionally like an ice-cream, but finding one which is not too sweet is difficult. Sometimes I like to dip into a box of chocolates – same thing. So is it any wonder that the overriding impression I had when I returned to the UK in 2004 after more than a decade away was of armies of grossly overweight beings swarming in every public space, particularly female (but I had come from the land of the sylph-like Romanian girls). Now you know why I called this blog GRUMPYtyke. There’s a helluva lot to grump about. As both a nutritionist and consumer I’m actually torn about the (voluntary) ‘traffic light’ labelling system that has recently been standardised across UK supermarkets. Unfortunately, I think that the most noticeable impact will be on those consumers who are already the most aware of issues relating to food and nutrition, and that it will be a very long time before food producers are forced to make any changes to recipes at all – especially with ‘big players’ like Cadbury and Coca Cola refusing to participate. However, I also think that this kind of declaration does increase at least the possibility for change, and firmly endorse any system that provides access to information. It’s a very different situation in the US (for example), where this kind of information is increasingly being hidden, and where – arguably – it could be of even greater importance / relevance. But I agree – there is definitely too much sugar here! And on a different note… I actually read the label as being topped with NIBBLED walnut pieces!